Hash oil is a very powerful medicine that is rendered from medical cannabis using a process that includes one or more harsh chemicals. The marijuana plant material is turned into hash oil through a process known as solvent extraction. This involves filtering and evaporating a solvent to create the thick resinous liquid oil. The process involves using chemicals such as butane, methanol, chloroform, ether, ethanol, or naphtha. Due to the fact that butane is often the preferred chemical for rendering hash oil, the finished product is often called butane hash oil (BHO) and the producers of BHO are commonly referred to as butane hash blasters. 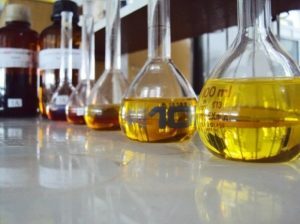 Another common method of medical marijuana oil production is known as carbon dioxide extraction. This process involves the use of compressed carbon dioxide gas to create a solvent that will cause a supercritical extraction of essential oils from a plant, or in this case a cannabis plant. While there is a lot of science involved in the extraction of THC oils, many consider it as much art as science and for this reason, oil makers are thought of as artisans, and the products of certain makers are regarded better than others. However, what they all have in common, regardless of their level of skill and craftsmanship, is that they are engaged in an illegal activity. The reason for this is the law in California that was written to punish those who operated illegal meth labs is broad enough to also outlaw the chemical extraction of THC oil from plant material. This was confirmed in a somewhat recent legal decision. However, it should be noted that it is legal to possess and use extracted hash oil so long as you have a valid doctor’s recommendation as you can discuss with our experienced Orange County medical cannabis lawyers. As discussed in a recent article from the East Bay Express, Governor Jerry Brown has just signed Assembly Bill 2679 into law and this will provide medical marijuana hash oil extractors the same protections as are afforded to medical marijuana patients and caregivers in California. The law is very detailed in the process that can be used to legally extract hash oil from cannabis and the law must be followed closely by anyone engaged in production of hash oil. However, anyone who does do things correctly will be protected from prosecution for running a butane hash oil blaster or a carbon dioxide extraction laboratory. This new law comes in addition to the sweeping legal reforms in the medical marijuana industry in California that have already taken effect or soon will take effect in the state following the state deciding to step in and regulate medical marijuana for this time in medical marijuana’s roughly two decades of existence. Prior to this, regulation was left largely up to the individual municipal governments and this created a hodgepodge of laws that ranged from very liberal to complete prohibitions depending on the municipality, and many saw if as a kind of Wild West mentality whose time had come.